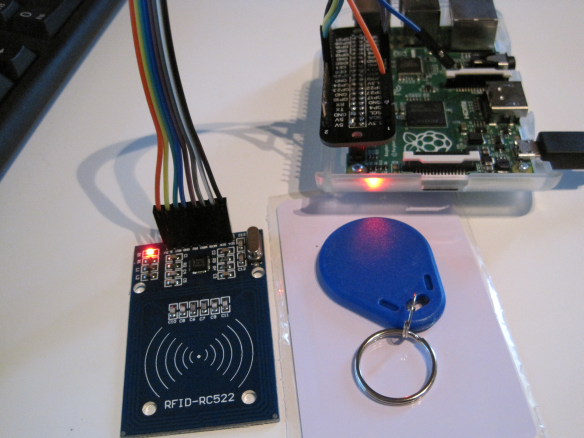 The RFID reader/writer (13.56MHz) RF522 for arduino can be used in Raspberry. In this first test, the steps described here and here were followed. They both are using the python source code. Please see these references for the correct connections between raspberry and the RC522 (see picture below). The reader can read MIFARE cards. The block diagram is shown below. The data in the EEPROM can be “read & write” with this RC522. 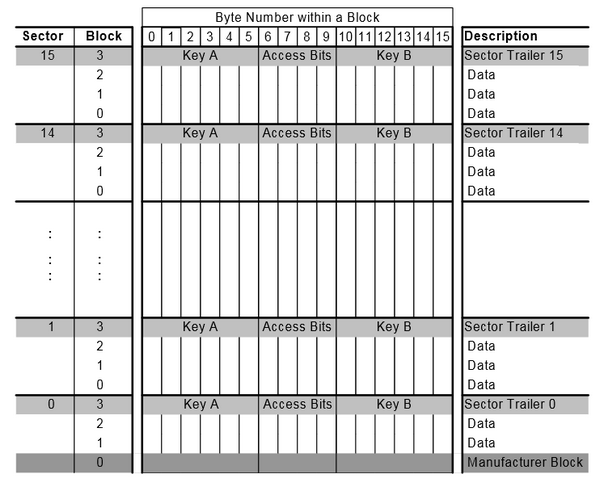 The 1024 x 8 bit EEPROM memory is organized in 16 sectors with 4 blocks of 16 bytes each. In the test, the source code worked out from the box without any changes..
A small modifications were made on the code to change the printout. /home/pi/SPI-Py/MFRC522-python/MFRC522.py:113: RuntimeWarning: This channel is already in use, continuing anyway. Use GPIO.setwarnings(False) to disable warnings. Modified/New sources. Just add/overwrite these in the same directory. It is difficult to find good RFID overview articles or presentations. Good starting point is the excellent book RFID Handbook, 3rd Ed. Hacking community has been active on RFID for some years. There are some ways to protect your RFID cards. This entry was posted in DIY, For Fun or Interest, Gadgets, Hobbies and Other Interests, Internet of Things and M2M, Raspberry Pi, Robotics, Tests. Bookmark the permalink.